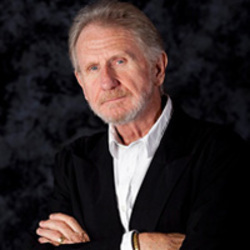 Born in New York City on June 1, 1940, René Murat Auberjonois knew he wanted to be an actor from the age of six. He grew up in a neighborhood in upstate New York where family friends and neighbors included Helen Hayes, Burgess Meredith, and John Houseman. He got his first job in professional theatre at age 16 thanks to Houseman and, later, worked for him at The Juilliard School. After completing his degree in theatre at Carnegie Tech (now Carnegie Mellon University), René performed in dozens of plays in repertory companies around the country, including the Arena Stage in Washington, DC and Mark Taper Forum in Los Angeles, and was a co-founder of the American Conservatory Theatre (ACT) of San Francisco. His first big Broadway musical was Coco, with Katharine Hepburn, in 1969, for which he received a Tony award, and he has appeared in many other plays since then, from Tony-nominated performances in The Good Doctor, Big River, and City of Angels to productions of King Lear (as "Edgar" for the New York Shakespeare Festival), Sly Fox (on Broadway, as "Jethro Crouch"), and The Imaginary Invalid (as "Argan" for the Shakespeare Theatre Company in Washington, DC). René has also been making movies since the 1960s, appearing in films such as M*A*S*H, McCabe and Mrs. Miller, The Eyes of Laura Mars, Star Trek VI: The Undiscovered Country (extended version), Batman Forever, and The Patriot, to name just a few. On television, René has guest starred on close to a hundred shows, from 1971's Mod Squad to 2011's Criminal Minds, and has been a series regular three times: on Benson (1980-86, as "Clayton Endicott III"), Star Trek: Deep Space Nine (1993-99, as "Odo"), and Boston Legal (2005-07, as "Paul Lewiston"). René's work as a voice actor can be heard on several dozen animated TV shows such as Xyber 9, Justice League, and Avatar: The Last Airbender; in animated films such as The Last Unicorn and The Little Mermaid; and on radio programs such as Bay Area Radio Drama and Selected Shorts. He has also provided voices for computer games (including the Legacy of Kain: Defiance, Uncharted 2: Among Thieves, and Fallout: New Vegas) and can be heard as the reader on numerous audiobooks. When he's not busy acting, René enjoys spending time with family and friends, and working on a variety of art projects involving photography, drawing, and wire and found-object sculpture. He is also a long-time supporter of the humanitarian efforts of such organizations as Doctors Without Borders (Médecins Sans Frontières) and Heifer International, and regularly donates the proceeds from the sale of autographed items to support their life-saving work. You can find more information about René's life and career at his official website, Rene's Page (www.renefiles.com).